Bayern Munich continued their desire to have the very best of young German talent at their club when they signed Serge Gnabry from Werder Bremen in summer 2017 as one for the future. With the likes of Thomas Müller and James Rodriguez meaning chances would likely be limited in the Bayern team, the Bavarians loaned the European Under-21 champion out to Hoffenheim for the 2017/18 season to gain further experience. bundesliga.com brings you 10 things you need to know about the future star of Bayern and German football. Born in Stuttgart, Gnabry was snapped up at the tender age of 12 by three-time Bundesliga champions VfB. Making his way through the ranks, young Gnabry would play alongside a number of future Bundesliga stars also coming through the club’s famed academy, including future Bayern teammate Joshua Kimmich, RB Leipzig’s Timo Werner, Borussia Dortmund’s Jeremy Toljan and Augsburg’s Rani Khedira. 2) Following in father’s footsteps? Gnabry was almost destined to be a professional footballer considering his father Jean-Hermann was an international for his native Cote d’Ivoire. Or was he? Rumours began to circle around the time of Gnabry Jr.’s signing for Werder that this may have been an early example of ‘fake news’, and Serge would go on to clarify the situation in an interview with Bremen’s club magazine. Premier League outfit Arsenal caught whiff of the electric forward's talents in 2010, but had to wait until his 16th Birthday before formally welcoming the U-16 Germany international to the English capital. After less than a season playing regular football for the U-18s, Gnabry was promoted to the Arsenal reserves. Gnabry scored his first Premier League goal at the third time of asking, in a 2-1 win over Swansea City on 28 September 2013. He registered an assist in his next outing against Crystal Palace, but a season of great promise met an abrupt end five-and-a-half months later with a serious knee injury, following which he never featured for the Arsenal first team again. That season he also featured twice in the Champions League, strangely enough against two Bundesliga sides: Dortmund and Bayern, coming on at the Allianz Arena in one of the Gunners’ few positive results against their European tormentors. A loan spell at West Bromwich Albion saw him make just three competitive appearances in 2015/16, but such a difficult campaign notwithstanding, there was never any doubt that Gnabry would not make Germany's 2016 Olympic Games squad. The 21-year-old had been an ever-present for his country at youth level throughout his stop-start spell in England, and it did not take long for the Stuttgart-born sensation to rediscover his best form on the big stage in Rio de Janeiro. Gnabry finished the as the tournament’s top scorer with six goals alongside future Bremen teammate Nils Petersen, two ahead of Brazil’s Neymar as Germany and Gnabry took home a silver medal. Gnabry has a rather embarrassing story regarding fan-boy antics towards former Arsenal teammate Mesut Özil. It’s a story that Özil has enjoyed teasing his young fan about. The 2014 World Cup winner has been more than just a role model for Gnabry down the years, though. Gnabry in fact went to Özil, and defender Per Mertesacker, for advice on a possible move to Bremen following the duo’s previous experience at the club. "Per and Mesut have only said positive things about the club," he said at the time of signing for Werder. "But it was my decision alone in the end to come here. I had very good talks with the management. I've come to get playing time, to develop further and to help the team." Gnabry scored his first Bundesliga goal on only his second appearance in Germany's top flight against Borussia Mönchengladbach and struck again against Darmstadt, Leipzig and Schalke. A maiden international call-up swiftly followed in November 2016, even if it did take a while to sink in. "[Joachim Löw] called me up but I had to think for a bit whether it was true or not," Gnabry told German media company RND. "There are so many hoax calls from radio shows and I really didn’t want to be a victim of that." Gnabry was probably still pinching himself when Löw handed him his senior international debut against San Marino on 11 November 2016. An early goal settled the nerves, while two more saw him become the first Germany debutant to grab a hat-trick since Dieter Müller in the 1976 UEFA European Championship semi-final against Yugoslavia. The only joke, as Bremen were only too happy to point out after the game, was on Arsenal. A move to champions Bayern followed that successful season, where he was immediately loaned out to Hoffenheim, reportedly at his own request. 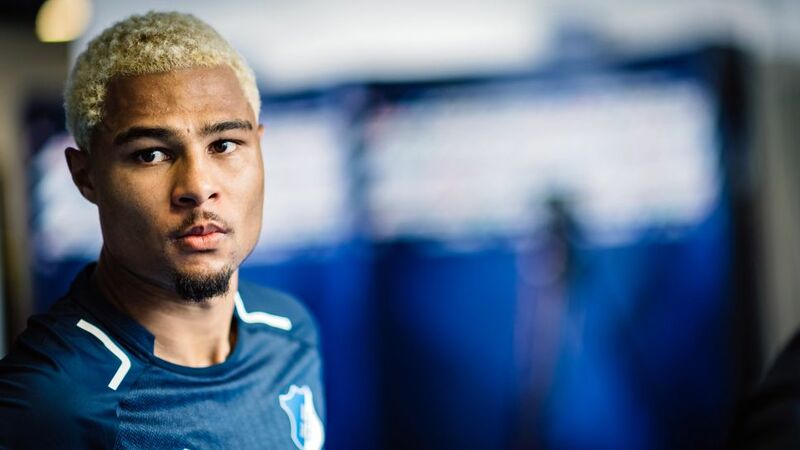 Gnabry’s time at TSG didn’t get off to the expected flier as injuries limited his playing time, but the 22-year-old signalled his arrival in Sinsheim on 2 December 2017 with his first goals for the club against Leipzig. The second was a lob from some 45 yards over goalkeeper Peter Gulacsi, and was named Goal of the Month by German broadcasters. In October 2017, Gnabry became the second Bundesliga player after Mats Hummels to sign up to the Common Goal initiative, pledging to donate at least one per cent of his wages to a collective fund managed by non-governmental organisation streetfootballworld. "One per cent is not a huge figure but it can make a huge impact if we commit to it as a team," Gnabry said. "I want to make giving back a part of football and help football feel good about itself again. I want to change the game for good."